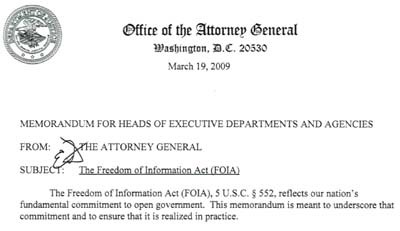 Washington, D.C., March 19, 2009 - Attorney General Eric Holder today released new guidelines for federal agencies on the Freedom of Information Act (FOIA) that reinforce the presumption of disclosure articulated by President Obama in his day one Memorandum on FOIA, issued January 21, 2009. In addition to the presumption of disclosure, the memorandum recognizes that the responsibility for FOIA administration runs throughout each agency and instructs that the memorandum be shared with all FOIA personnel. It encourages the use of technology, proactive posting of records of interest to the public without the requirement of a FOIA request, and tracking of FOIA requests.